Celebrate Chicago’s creativity at the Fifth Star Honors, a night of stars under the stars honoring legendary Chicago artists and cultural institutions with live performances and video tributes. The City of Chicago will also honor outstanding youth with The Rising Star Honor Roll – a recognition program for students who show creative leadership, passion and exceptional skill in the arts. 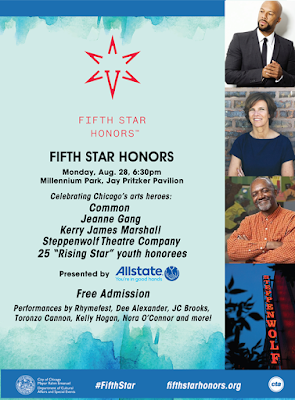 The Rising Star Honor Roll inductees will be announced later this summer, and an awards ceremony will be held in their honor at the Chicago Cultural Center in advance of the Fifth Star Honors show and concert in Millennium Park. The honor celebrates the creative spirit of the next generation as an essential part of Chicago’s cultural life. View the 2017 Rising Star Honor Roll.